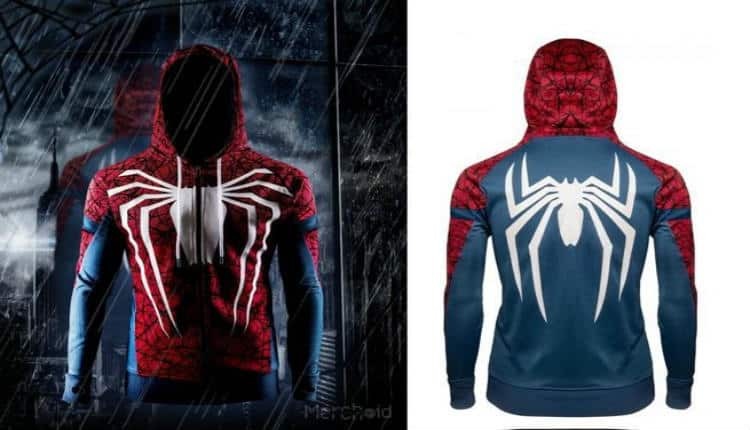 Spider-Man PS4 Hoodie is the Greatest of All-Time | Nerd Much? Insomniac Games’ Spider-Man should be hitting the PlayStation 4 sometime this year. And to truly immerse yourself in the web-slinging experience, you’re going to need the proper attire to bring it all together. Luckily Merchoid has just the garb for you. The Spider-Man: White Spider Premium Hoodie dons the design straight out of the upcoming PlayStation 4 game. It sports a primarily red front with scattered black webbing, blue sleeves, and a large white iconic Spider-Man spider. The back of the zip-up hoodie is primarily blue with the white spider emblem as well. There have been a few rumored released dates for the PlayStation 4 game. GameStop listed a pre-order mentioning June 30th. Other reports indicated a possible September 28th release. And while there’s no solid date for the game, we have a general idea as to when we’re getting the hoodie. It will begin shipping in June. Merchoid is also rocking a slew of Avengers: Infinity War inspired items right now. They have Avengers, Black Panther, and Ant-Man zip-up hoodies. T-Shirts inspired by the Iron-Spider suit, Thanos, and a variety of other characters and designs. And accessories including wallets, hats, wristbands, mugs – and even the Infinity Gauntlet itself. With merch like this, games like Spider-Man coming and Avengers: Infinity War hitting us next month, it’s truly a great time to be a nerd.